Lauren, a language teacher who grew up in Northeast Philadelphia and Marlton, spent spring evenings in 2011 tutoring two moms of her Cherokee High School students in Italian. "We should go on a field trip to an Italian restaurant where we can speak to the owners and staff in Italian!" one mom suggested. The three women were having a blast when Juan, their server, approached. He flirted with all of them in the mild way that servers do but lost all concentration when Lauren looked at him. "Her eyes are so gorgeously green and penetrating," he said. Nearly two years later, in October 2013, Lauren again walked into the restaurant – with her family for her brother's engagement party. Juan was their server. "I remembered her eyes right away," said Juan, who grew up in Bogota, Colombia, and moved to New Jersey in 2004. As the evening went on, Juan got a sense of Lauren's kindness and fun. He told his boss he remembered the woman with the green eyes from 2011, and his boss decided somebody had to do something. "My server is interested in you," he told Lauren, in Italian, "Do you like him?" Lauren said she couldn't know unless she got to know him. "Can I introduce you?" the restaurant owner said. "He's a really good guy." Lauren agreed, and the boss brought Juan over. "The way that he looked at me, I don't think any man has ever looked at me that way in my entire life," she said. "It was like I was the only person he could see." Plus, she liked the sparkle in Juan's eyes. He was so nervous! "I didn't know what to do, so I asked her for a hug," Juan said. She hugged him — an A-frame with a good amount of distance between them, but still. Juan asked if he could contact her later. She said yes, expecting never to hear from him. Juan's shift ended at 11 p.m.; his text arrived at 11:01. Three hours later, they made plans to go to Dublin Square, where they talked about their lives and families and shared their first kiss. "It was just a kiss, but it also seemed like more than just a kiss," Juan said. "I had never experienced a first kiss with that much heat," Lauren agreed. Soon, the server and the teacher were together every day. Seven months in, they were at the Cherry Hill P.J. Whelihan's when Lauren got an automated security system message that there'd been a break-in at her condo. She panicked. Juan said he'd drive her home. They arrived to find fire trucks, police, ambulances, and news crews. The building had been struck by lightning, and firefighters had to break in. The building was not safe. "Do you have someplace to stay tonight?" a police officer asked. "Absolutely," Juan said. "She's staying with me." It was supposed to be for the weekend, but the damage was much more extensive than originally thought. The first six months were not easy. Lauren is super-organized and always has a schedule. Juan is much more go-with-the-flow and has no fear of clutter. They argued at first, but it got easier and easier for the couple, who remain in Mount Laurel. "I love everything about her — the way that she cares about her family, her students, her dedication to what she does for a living," said Juan, who is now 37. "I don't think I've ever met anyone who is as generous as Juan is," said Lauren, now 32. He shares her love of languages and teaches her things she never knew. "He always asks me to tell him how my day was — the story of how it was. And we never have a conversation where I don't walk away thinking how brilliant he is." In mid-November 2016, Juan took Lauren to Hershey Park — her "happy place" — and Christmas Candylane. It was 75 degrees when they arrived, but while they were on the Reese's Xtreme Cup Challenge attraction, the weather took a stormy turn. The rain and wind sent tree branches flying — along with Juan's plan to pop the question at the top of the Kissing Tower, which the park shut down. "He's clearly upset, and I'm thinking, 'Why does it matter? We can kiss anywhere,' " Lauren said. "And then it started to hail." To Lauren, that provided a great excuse to indulge in two of her favorite things: a cup of hot chocolate and the indoor tour on how Hershey's milk chocolate is made. "Of course, everybody had the same idea," Juan said. "We finally get onto the ride, the one she's loved since she can remember, and I got down on one knee." Lauren didn't notice. "She was paying attention to the cows, singing about how they make milk for the chocolate. She is singing and dancing along, even though she has seen this thing 100 billion times," Juan said. "I tapped her on the shoulder." Lauren looked away from the cows and saw her boyfriend offering a ring. "Will you continue to make me the happiest man for the rest of my life?" he asked. She would, and he had her rapt attention. "It was the first time ever I was not paying attention to every second of that ride," she said. Lauren Ratkis’ godson played “Here Comes the Bride” on his bass clarinet. Lauren used to spend her summers at her grandparents' house in Cape May. Grandpop Silverio gave Lauren her love of the Italian language and inspired her to teach it. Once, as they walked by the water past a wedding ceremony, Silverio said, "Sweetie Pie, one day you'll get married on the beach." Silverio died in 2008, but Lauren and Juan thought a Cape May beach wedding would make him part of it. Before they wed, the couple visited Silverio's grave. As they placed a flower from her bouquet on the earth, a seagull that sounded just like Silverio's feathered friend Sarge called out. "I knew he was there," Lauren said. At the start of the ceremony, held on the sand at the Grand Hotel, Lauren's godson played "Here Comes the Bride" on bass clarinet. Juan said traditional vows to Lauren in Italian, and she to him in Spanish. In English, they exchanged words they wrote for each other. Bride and groom poured sand into a container to symbolize that their two lives brought together could never be separated. At their Willow Creek Winery reception, the 120 guests enjoyed the music of the Verdict – a reggae band Juan has followed for 15 years. "The food was incredible, and so was the cake," Lauren said. "I love cake, and it tasted as good as it looked." How's this for a Jersey flavor: Blueberry Velvet. Juan's mom, Gloria, and Grandma Dolly live in Colombia and couldn't be there in person, but various relatives and friends passed around an iPad so they could watch the ceremony and enjoy the reception via FaceTime. The couple’s wedding included a sand ceremony to symbolize the combining of their individual lives into one. 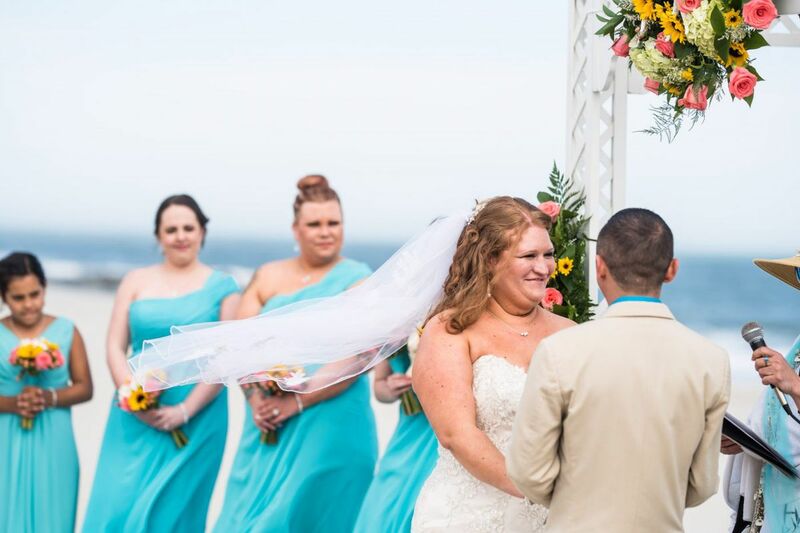 The couple saw each other for the first time on their wedding day on the beach. "He was facing the ocean, but I could see even from behind how handsome he was," Lauren said. The photographer told Juan to face her. "He took off his sunglasses so he could see me better. 'Hello beautiful,' he said. 'It has been the longest day, and I have missed you so much.' My heart swelled." Though they had seen each other earlier, officiant Crystal Hardin wanted the moment Juan saw Lauren walking toward him at the altar to be special. Hardin told Juan to keep looking at her, or at the ocean, or anywhere else besides the direction where Lauren and her dad were making their way across the sand. Finally, "She said, 'OK. Look right there.' And there she was," at the foot of the aisle, Juan said. "Forget the gown — the first thing I saw was her eyes. The fancy dress and the makeup were nice, but underneath it all I saw the woman I love every day," he said. "I was so glad to be marrying her." A bargain: Thanks to Juan's frequent appearance at their gigs, the Verdict gave the couple a discount. The splurge: They treated themselves to a suite at the Ocean Club Hotel and hired a trolley to take the bridal party and family from hotel to venue. A three-night mini-moon in the Grand Hotel honeymoon suite, to be followed by a week at Universal and Disney this summer, after the World Cup. Officiant: Crystal Hardin of Crystal Marry Us, Cape May. Ceremony: Grand Hotel Beach, in front of the Ocean Club Hotel, Cape May. Reception: Willow Creek Winery, Cape May. Food: The Southern Mansion, through Willow Creek Winery. Cake: Sweet T's Bakeshop, Haddonfield. Music: The Verdict, Avon by the Sea, N.J. Photography: Laura Napoli Photography, Marlton. Videography: John Martin, Martin's Accent Videos, Mays Landing, N.J. Flowers: Cape Winds Florist, Cape May. Dress: Irma's Bridal, Cherry Hill. Hair: Natalie Pearson, Mount Laurel. Makeup: Madison Spera of MadMakeup LLC. Transportation: Trolley from Mid-Atlantic Center for the Arts and Humanities, Cape May.